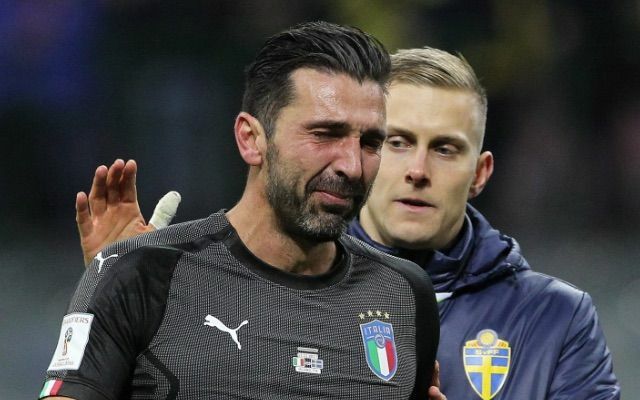 Gianluigi Buffon made his 175th senior appearance for Italy on Monday and it turned out to be his last as the Juventus icon retired from international football following his country’s failure to qualify for next year’s World Cup. Italy were held to a goalless draw in Milan by Sweden, who booked their place at Russia 2018 at the Azzurri’s expense by securing a 1-0 aggregate victory in their two-legged playoff. Buffon was an emotional wreck after full time as he declared his international career over. Italy will miss him, and so will international football. “It’s disappointing,” he told Rai Sport, as translated by Football Italia. “Not for me, but for the football movement, because we failed at something that could’ve been truly important for the country. Buffon was a virtual spectator for much of the match at the San Siro, where Italy dominated the game in terms of possession – 76% – and shots – 27 to Sweden’s four. The match was played in front of a passionately partisan crowd and many Italy supporters did their best to unsettle the visitors before kickoff by booing the Swedish national anthem. As the Italian fans booed Sweden’s national anthem, Buffon stood there and applauded. Buffon showed his class though as the 39-year-old Juventus legend reacted by applauding the song. Russia 2018 will be the first World Cup not to feature Italy since the 1958 tournament, which was held in Sweden.